To start the custard, preheat your oven to 325° Fahrenheit (165° C). Heat the cream over medium-low heat. Meanwhile, slice the vanilla bean in half lengthwise. Scrape out the seeds, using the back of the knife. Add the seeds and the vanilla bean to the cream, along with the finely-grated orange zest. Whisk everything together and let the cream come to a simmer. Meanwhile, place a bowl onto a wet towel to hold it in place. Whisk the eggs and sugar together. Once the cream comes to a very gentle boil, add a small amount to the eggs to temper them. Continue to whisk as you slowly add the rest of the cream. Strain the custard mixture into a pitcher or large measuring cup. Next, place the ramekins into a large casserole dish with at least 2” -inch sides. Pour the custard into the ramekins, filling them only about three-quarters full. We used 3 1/2" -inch x 1 1/2" -inch ramekins, but you can use any size you like. Just keep in mind that different sizes will affect the cooking time. Transfer the ramekins to the oven. Carefully pour boiling or very hot tap water into the casserole dish until it reaches at least half way up the sides of the ramekins. Bake the custard for approximately 20 to 25 minutes, but again this will depend on the size of the ramekins that you have used. To check the custard, use a pair of tongs to gently shake the ramekin. When done, the custard should have a nice, uniform jiggle. Remove the custard from the bain marie and place onto a cooling rack. If any of the custards seem slightly underdone, leave them in the bain marie for another minute or so out of the oven. They will continue to cook a bit in the hot water. Once the brûlées have cooled, place them into the refrigerator for at least 4 hours…or better yet overnight. This will give the custard plenty of time to fully set. To serve the custard, sprinkle some sugar onto the surface of the cold brûlée. To caramelize the sugar, you can use either a small kitchen torch, or a regular torch which can be found in any hardware store. Let cool for a minute to allow the sugar to harden, before serving. Crème Brulée is delicious and pretty much hassle free. Especially if you let you guests torch the top themselves. There is less of a risk of water getting into the ramekins if you fill the casserole dish with hot water once it is in the oven. If you really like the topping of crème brûlée, then use ramekins that are wider and more shallow. Ramekins that measure 4 3/4" in diameter work beautifully for this dessert. Crème brûlée is really very easy to make and it can be made up to 2 days in advance, which makes it a great choice for a dinner party. Well, I think every country in the world has it's own crème brûlée recipe. but the fact is that crème brûlée is a french world meaning "burned cream". I love that everyone is so passionate about brûlée. I have to say that I agree with the last comment from Hugo. I also tend to judge restaurants by their Crème brulée. I guess I am a bit of a Crème brulée snob! Is that so wrong? Crème brûlée is a very commun dessert in most of french restaurants. Nowadays this dessert comes in a lot of different flavors, like café, pistachios and rasberries. I really don't like in restaurants when they served this dessert warm. I really think the cream has to be cool with only the caramel crust on top of it warm. How to tell when crème brûlée is cooked. First off I am glad you liked the flavor of the brûlée. As for the consistency, crème brûlée is a bit more runny then say... crème caramel. It's more like a pudding. You must give it a bit of a shake test to see if it is done. I use tongs and give it a bit of a shake to see how the brûlée moves. It should not look runny in the middle, rather the whole thing should jiggle a bit. Even myself, I have made crème brûlée about 500 times and every once and a while I haven't let it cook quite long enough. Sometimes the oven may have been off a few degrees, or the water bath wasn't as high as usual. Really I don't sweat it, as the flavor is still delicious. Once you make this dessert a few times you will know when it is done. Perhaps next time leave it for 2 more minutes and see what kind of a result you get. Just try not to over cook the crème brûlée (well maybe just once over cook it and then you will know why i say this). Also check you oven temperature. Good luck, hope this helped! I would never have tried this recipe if I hadn't seen the video. And, based on my experience, the video made the difference between success and a disaster: the part of the video which showed just how much "wiggle" I should see saved me from pulling the ramekins out of the baine marie a couple of minutes too early. My only *slightly* negative comment is that the printed instructions didn't mention (though it was mentioned in the video) that the water should be boiling hot. Fortunately, I remembered that as I was creating (!) in the kitchen and the result was excellent. My wife kids me that I won't buy a recipe book unless it has pictures. The vids here show just how useful vids and pictures can be. You are right-on when you say be prepared and don't rush. Can you imagine using a microwave oven to temper the eggs? As for the torch, it's a propane gas torch you want to get. This tool is in the top 5 of most often used in my kitchen. I use it to bring the flavour of BBQ grilling to my stove-top dishes. If I am stir-frying a bit of pork &amp; veg., I always hit the meat with the torch while it fries in the wok. This flavour (the caramelizing of the sugars on the surface of your food) reaches way back in our primal minds. And the message is FOOD! GOOD! Try one for a while and see what you think. all ingredients..are amazing together...(but..depending...how your oven baking....,be carefully about (20 to 30 minutos baking that creme.)and.. if it needs more time leave til 45 minutes. Adding a little lemon zest , will be great!! I'm going to make this just so I have a reason to buy a torch. I read one recommendation about using it on meat in a wok; can anyone recommend other uses for a torch in a kitchen? Is it possible to substitute the sugar with splenda? I tried making these 3 times with time adjustments till about 50 minutes in the oven at 300F but still runny eventhough it jiggles when i took it out. Or do i need to let the cream boil? I have no problem with caramelizing. I used turbinado sugar for it. Our recipe is not formulated to be used with artificial sweeteners, such as Splenda. Without adjusting the formula, artificial sweeteners cannot substitute sugar 1:1. They just don't contain the same properties. Since we do not use artificial sweeteners in our Test Kitchen, perhaps you can contact the manufacturer to obtain replacement guidelines. We tried looking on Splenda's website for a brulee recipe, but didn't find one. However, if you search online for "creme brulee made with Splenda", you'll find quite a few recipes. Hope that helps. Good luck! I followed this recipe exactly as shown in the video, except the size of my ramekins was a little bigger than what was used in the video so i has to cook it for a lot longer...even after being refridgerated for over a day its runny at the bottom.. help:(.. also because of the orange zest it tastes more like orange creme brulee or am i using too much?? Size of the ramekins may have made a difference, but there are many other factors that it could have been. Maybe read the message I posted earlier called..."Cooking Crème Brûlée". As for the orange zest, perhaps just use a bit less. It is supposed to give you a hint of orange flavor. However, you can omit the orange zest all together if you like. My first recipe I followed on Rouxbe.com. It turned out great thanks to detailed video instructions. Everybody in my family loved it. Thanks Dawn, il try them again and let you know how it goes. in greece u can tast it in diferent way the flavour changes.. but i like the original one the the way that u saw!!! i try make it and it was very very good!!!!!! There have been several comments about torches so I thought I'd add a little story of my own. The first time I made creme brule (see my other comment on this thread) I used a standard garage propane torch. It worked fine ... well, fine *except* ... it seemed to have a very strong gas flow and that -- even though I had it turned down -- still blew many of the sugar granules around. So, next time, I went to a local kitchen store and bought an inexpensive torch. On the way home, I picked up a butane cartridge and, at home, I loaded up the torch and tried it out. Wow! A yellow flame -- almost a metre long -- leapt out! Then, suddenly, it dropped back to a 5-10cm blue flame. Just what I wanted. But I was, naturally, worried so I tried the unit again. And again. And each time I'd get a long yellow flame for a few seconds before seeing the desired 5-10cm blue flame. Back to the store with the unit, a quick demo of the problem and I got a new one. This time, I loaded it in the store and tried it out while I was still there. The replacement unit worked perfectly. So ... if you are going to buy a kitchen torch (instead of using one from Canadian Tire) then buy a butane cartridge first so you can try the unit out near the store in case you need to exchange it. One other thing (which I have noted before): the printed instructions don't mention that the water in the bain marie should be boiling. If you print the recipe out then make a notation to that effect. A final thought: this is a "do not rush", focus on what you are doing, watch your timing, and check your "jiggle" as you approach the end of the cooking time. If you take care you are almost guaranteed a perfect result. Just to clarify...you are right, the water that gets added for the bain marie, should be very hot or boiling. But once the brûlée starts to cook inside the oven, the water should not be boiling. The water merely surrounds the brûlée with gentle heat, so it cooks evenly, and doesn't curdle. Thanks for the blow torch stories! Have a great day. John, you're right about that flame! Why that happens: In a cold torch (just turned on), the gas from the cannister is cold and dense and can't burn all at once. Therefore it burns at a low temp and FLARES! Once the torch is warmed up (a few minutes) the gas can vaporize and burn more efficiently. If you shake the can, you can get the same effect; huge flame shooting out like a circus act. N.B. Don't freak out and drop the torch, just point it away from you and maybe over the stove. It'll settle down and after a couple of minutes will be warmed up and ready for anything! A restuarant I like to frequent makes creme brulee with spirits in it (tahitian rum, lemoncello etc.). I've never tasted a desert so good! I'd like to try duplicating this at home. I was thinking that I should add the spirits just before pouring into ramekins. Does this make sense, or is there a reason to add it at a different timing? When to add the alcohol? The alcohol, whether it be Grand Marnier, Limoncello, or Rum, should be added at the beginning. I sometimes add a teaspoon or so in the beginning to the cream. You could even evaporate the alcohol (by about half) in the pot, before you add the cream. If you add the alcohol at the end you will slow down the coagulation (basically it will be like adding water). Traditionalist even say (okay, a few people here at Rouxbe) that no alcohol should be used. They say it should be served on the side in a glass with some ice. Instead add a bit of zest instead. But this is a matter of taste and tradition, so have fun and let us know how it turns out. Good luck, hope this helps! I watched that link, and yes both ways work, but the first technique (using egg shells to separate) can be very bad because its the outside of the shell that contains salmonella and there is a higher risk to getting the bacteria in the egg by separating the eggs with the shell. the bowl technique is the way to go. You really just need to whisk the two together. You are not looking to add any volume here. About 15 seconds is sufficient. Generally crème brûlée should only have a nice rather thin layer of sugar topping. It is not meant to be thick. The delicate sugar coating adds a nice gentle contrast to the soft custard beneath. Of course, if you loved the thick coating then feel free to do it that way. But just know that the thinner coating is more classic. Hope this helps! Thank you !! Should I cover the custard before refrigerating??? I would say no, as this likely caused condensation which is what made the sugar soak in more and become wet. Comments: I've made this twice now, once w/vanilla bean seeds and once w/real vanilla extract. Right at 22 minutes, it already doesn't shake quite as much as demonstrated in the video. Not sure if water in baine marie should be near boiling or just warm to heat w/the oven. Recommendation" EXCELLENT. Not too sweet. just right. Thank you! The texture of the cream turns out solidify. What happen? Thanks. I am not sure exactly when you mean. Do you mean once it is cooked it was solidified? If so, it was likely just overcooked (perhaps the oven was too hot or it was left in for too long). Yes. That's what I meant. I'll try again. Thank you. was wondering if i can steam this directly in a steamer? without using an oven? Yes you can, but make sure the steam is gentle and no condensation on the lid drips into the custard. You may have to keep your lid ajar, or loosely cover the custard with foil poked with a couple of holes. Steam till the middle feels just set but still a bit jiggly. Thank you so much for this recipe. I have tried two others, one which did not include oven baking and one that did, and neither turned out as good as this one. Do you have any thoughts on using different types of sugar for the caramellized lid? So glad that you liked the recipe and that you had success! As for other sugars to use for creating that wonderful crunchy topping - you could use brown sugar, light brown sugar or even turbinado sugar (I quite like having turbinado sugar in my pantry, for those times when I want to add a slight twist to sweet things). Good luck, hope this helps! First off, love the recipe- I really want to try a pumpkin-flavored brulee for Thanksgiving. I hear Earl Grey works well also. Here's my issue- perhaps I'm over-whipping the mixture, but after mixing the eggs and cream, I get about an inch of foam on top. When I pour into the ramekins, about half is foam. Should I let the mixture sit for a while? Or should I just scoop off the foam with a spoon? Or am I just whipping too much? Anyone else have this issue? Any tips? Thanks! I suggest just simply straining the mixture before you pour it into the ramekins (as in step 1 of the video). I have made creme brulee hundreds of times and this seems to work every time. Hope this helps! I have had creme brulee in restaurants where the vanilla seeds are suspended in the custard. but when I do it they always settle. You do not really ever stop the seeds from settling, you can stir it as you pour the custard in the ramekins, but inevitably many of seeds will still settle to the bottom. Honestly though, this is a good thing, the seeds are the evidence and prize that you used the real thing (a real vanilla pod as apposed to vanilla extract. So I say, let the seeds settle and enjoy! My daughter (age 11) made this for Thanksgiving. We live in Switzerland just near the border of France, and celebrated it with American and French friends in France. Patrice, a semi professional baker, started the clapping. Then everyone joined in the ovation. It was fabulous - the recipe, the flavor, and the accolades for my daughter (who at this point wants to be a pastry chef). Thanks for a great recipe/tutorial. Thanks for this great recipe. Creme Brulee has always been my favourite dessert and I've never made it till now. This has been said many times before, but it is beyond valuable to be able to compare what is in front of you in the kitchen to what Dawn is doing in the video. Being able to judge 'done-ness' makes things so much better. I made this for the first time yesterday and it turned out quite nicely. A couple of notes/comments/questions: - I found the orange to be a bit too over-powering (great flavour, just masked the vanilla), so I'll cut back on that next time. - I saw the comments re: covering while chilling. I covered mine and found that I had a hard time getting a nice crust to form when torching. I imagine it was the condensation on top that was making the sugar too wet. I really want that nice dark, even, 'restaurant' shell on top. - What would be the best way to make a chocolate creme brulee? Add some cocoa to the cream? Melted chocolate? I'm excited about some more dessert/pasty lessons coming online. Thanks to all! Any oven-proof casserole (or any other pan) dish will work fine. You are correct that the flatter it is the better; however if the one you used didn't cause the creme brulee to cook on a slant then that is fine as well. We only used a glass casserole dish in the video so that people could see. Hope this answers your question - good luck and happy first time. I made this the other night. The recipe is sooo quick and easy. One thing, however, they say is an option is the orange zest. My recommendation: USE IT. It adds so much more of a complex flavor that you'll love it. Also, if you are a huge fan of vanilla like I am, use a dab of extract to compliment the seeds from the bean. Some were difficult in setting. Please note that if you think it doesn't look set and you think it'll set in the fridge, DON'T COUNT ON IT. Make sure you get it to set before it comes out of the oven. Just take out the ones that have set aka the even jiggle. until next recipe !! Have fun !! I made this for the first time ever last night for my wife and she said it was absolutely perfect. I wouldn't have tried it if it was not for the confidence I had after watching the video. Even though it took mine 35 minutes to cook vs. the 25 listed, I never worried thanks to the visual cues provided in the video about the "wiggle" of the custard. I knew I was on track. Someone asked about torches. I used a MAPP gas torch and it worked great. It's the one in the hardware store in the yellow canister next to the blue propane ones. It burns about 1400f hotter the propane and made quick work of the sugar. I have the torch for lighting lump charcoal for grilling. It's the fastest way to get it lit and doesn't include any smelly chemical odors like lighter fluid. I just used 6 egg whites for a different recipe and my father in law is coming into town a couple weekends from now. I immediately put the yokes in a container and refrigerated them (this is a day ago). Can I freeze them to use when I make the creme brulee or should I just cut my losses and use new? Thanks!! Pastry shops and professional kitchens usually have an excess of whites or yolks and never throw out the excess. It is ok to keep cracked eggs in the refrigerator for 2-3 days and then use them, but only if they are going to be cooked through. It is fine to freeze egg whites or egg yolks. Simply thaw them in the refrigerator. Once thawed, use immediately. Again, these eggs should only be used in products where they will be cooked. Hope this helps! Hi: I was looking into a torch for this dessert and came across this: The thing you do NOT want (and probably won't get if you don't go looking for it) is MAPP gas, which is propane with rocket fuel added to it, burns at an extremely high temperature, stinks real bad, is probably very bad for you, and always comes in a yellow canister. It's also about 4x more expensive than propane and has the word MAPP prominently on its label, so it's hard to go wrong. If this is correct, I wouldn't think it's a very good idea for the home cook. Do you have an opinion on this? It was mentioned by Chris G. Thanks. I have also heard that the MAPP gas is not the one you want to use, but I am not an expert when it comes to this stuff. I use a propane torch from Benzomatic. Perhaps there is someone else that has an opinion here, but for now Judi I would stick with the propane canister. Cheers! What about use Grand Manier or Controy instead of orange zest? Do the alchohol has any adverse effect? Do I need to consider something during preparation? You can use either of these instead of the orange zest. You can also leave the zest in if you like. No special changes or adjustments during preparation. I would suggest only using about a tablespoon or so of either liqueurs; just enough to lightly flavor the cream. Cheers! A propane torch is ideal for caramelizing the sugar on top of the custard. You can control the heat and spread it around the surface to quickly caramelize the sugar. They are quite inexpensive and worth the few dollars to ensure success. Do not use a toaster oven - they are usually not hot enough. You will run the risk of melting the custard before the sugar on top becomes caramelized and wind up ruining your dessert. You can try the broiler in your oven, but make sure it is very very hot. Some home broilers just can't get hot enough. Again, you may run the risk of the custard melting before the sugar is caramelized. I don't think it's worth it - sometimes certain tools are required for the best results. Cheers! This recipe and video is incredible. I have just eaten ny fourth batch and have a few comments. I'd appreciate any reactions. First and every time, I have used Triple Sec for the orange flavor. After the vanilla bean in the first batch, I have been cheating and using a half teaspoon of pure vanilla extract which has eliminated the straining and making this very easy to prepare. I found in the first two batches, 20 minutes produced a very firm custard which was creamy but not the velvety smooth texture of good restaurant creme brulee. So, I reduced the cooking time to 18 minutes and allowed the ramakins to remain in the hot water for an additional minute outside the oven - and it turns out perfect. After chilling, I found just before torching, that if I dip my finger in water an lightly coat the surface of the creme brulee, I can add the sugar, swirl it around then dump the excess while a perfect amount of sugar sticks to the wet surface for immediate torching. So that's my two bits - any comments would be welcome. What an incredible recipe. Hi John, It doesn't sound like you cheated at all! It sounds like you are using your intuition and common sense to guide you and find what works for you. All ovens are different, so your adjustments with cooking time have proven to work. As far as the substitutions go, it's all about experimenting and trying different things. Glad that you didn't make the flavors too crazy though - sometimes people get carried away with changing a classic way too much. Overall, nice job! Glad to hear you are having great success in the kitchen. Happy Cooking! Hi, I was just wondering if vanilla bean made that much of a difference. Thanks. I may be wrong but bean vs extract sure didn't make much difference to me and the extract was much easier to use. This recipe turns out perfectly every time. I think this may just be one of those ingredients that comes down to personal preference. I use both depending on my mood and what I am making. Cheers! i made this and is wonderfull! !now can i put some syrup to the top to give the brule another contrast it will be ok or it will destroy it??!!! You could give it a try but I cannot say it would work. That's the fun of cooking we are all free to experiment - sometimes you end up with a winner, sometimes you end up with a loser - but either way you always learn something. Cheers! The top layer of the creme brulee started turning really brown while in the oven and it had only been in there for less than 20 minutes, I checked it and it hadn't set yet so I left it in there a full 25 min. til it set, but my question is why do you think the top layer burned? Your oven was likely just too hot. Do you have an internal oven thermometer to test the actual oven temp? Also, was your rack in the middle of the oven? Next time, if this happens again, place a piece of foil oven the top of the brulee as they bake. Cheers! Probably so, it might have been too hot. I was making the recipe and I accidentally used the whole eggs and had to run to the store to get more eggs and I left the oven pre-heating the whole time, so it might have been too hot. The creme brulee was right in the center of the oven. I'll try this again soon and I'll get an oven thermometer, thanks! Cooking times will depend on how big the pie plate is. Follow the instructions in the video and check for doneness by the jiggle. Cheers! i know all milks will curdle when heated too much, but what about cream will half and half, light cream and heavy cream curdle when heated and acid is introduced? I just prevued this recipe and it is very similar to the one that I use. The difference is that I heat the cream and sugar on the stove with the vanilla bean and in a mixing bowl, add the eggs and some vanilla extract. When the cream is ready, the eggs are tempered and the rest is the sam. Has anyone tried this? If not, give it a try, let me know. Due to the high fat and low protein content in cream, it is less likely to curdle if it is boiled or if an acid is introduced. Milk products that are lower in fat, such as half and half, light cream and milk will not curdle if they are boiled, but will curdle if an acid is introduced. Low fat milks curdle because there’s not enough fat to intercept or prevent the proteins from binding to each other. Cheers! How can one go wrong with a classic creme brulee? Such a crowd pleaser. But after trying lavender and cardamon ice cream recipes, I thought maybe they might work with the C.B. as well. The lavender varation was not that nice. Afraid of using too much lavender and end up with a soap-like smell, I maybe used too little. The cardamon was ok. The one with orange blossom water reminded me of crepe suzette. Not bad. The version I made infusing the cream with fennel seeds - later discarded, of course - was a winner. Although happy by trying variations, I must admit the classic version is still the best one. The last time I tried to make custard it turned out scrambled and was inedible. When tempering the eggs is there a danger that the soft boiling cream could cause the eggs to scramble? Neither the video or the text mention this possibility and how to avoid it! When you add the hot milk to the eggs, be sure to add only a little at a time and whisk constantly. This is tempering. Here you are bring the egg temperature up to the temperature of the milk. If you do this too quickly and do not stir vigorously, the eggs could cook (scramble). If you do this slowly and whisk brisking, you should not have any scrambled eggs. Yes, as shown in the video, after the cream has been tempered into the egg and sugar mixture it needs to be further cooked in a baine marie in the oven. Cheers! I've made this lots of times successfully, but for the second time when I am in a new place it has acted up a bit. My brulee seems fine initally. I temper it slowly, add boiled water to the water bath... but then once in the oven it refuses to set! I keep cooking it, then it comes out curdled. Is this a problem with the tempering or would it be more of an oven temperature issue? This sounds like an oven/temperature problem. Have you checked the internal temperature of your new oven with an oven proof thermometer? If substituting vanilla extract for the whole vanilla bean in the Creme Brule recipe, how much extract would you use? If using pure vanilla extract use about 2 teaspoons. I have used up to a tablespoon, for this recipe but you may want to taste the mixture, to see how it tastes to you. I have also left out the vanilla all together. Which makes for a brulee with a more pure/clean sort of orangy flavor (hopefully that makes sense), so feel free to experiment. Hope that helps. Cheers! Thanks, Dawn, for your quick response. I ended up using 3 tsp. of the vanilla extract. The crème brulée was a success with my daughter, grand-daughter and myself. The orange zest still provided a nice undertone. I plan to experiment by making this again using the whole vanilla bean and also omitting the vanilla all together as you suggested. Mahalo! I'm planning on trying this recipe tomorrow and my oven can be used as either a convection oven or non-convection. Would you advise using the convection oven and reducing the temperature and cooking time or use the non-convection function of the oven? I would use the non-convection, regular setting. Nice gentle heat to cook the custard. Enjoy, it's delicious! Cheers! Hello, the dish was delicious but it was like a thick paste and not very creamy. I'm not sure if I over cooked it at 30 minutes or made the Bain Marie too high with boling water. Thx for the help! As you mentioned, it sounds like you likely overcooked it—either by cooking it too long, or the temperature was too high? I would recommend that you watch the video again and try it again. Also, be sure to check the internal temperature of your oven to see that it is reading correctly. Cheers! I made this recipe last year for Christmas and it was delicious. I used the same small, deep ramekins shown in the video. I made it again this year for Thanksgiving and used wider but shallower ramekins (5" x 1 1/2") and checked them after 15 minutes. At that point they were solid - no wiggle at all. So I removed them from the oven and debated whether to make another batch, but ultimately decided to try them and see what they were like. Well the texture was soft and velvety and the flavor was good, but I could definitely taste egg. Then I realized I'd used extra large eggs instead of the large eggs that the recipe calls for. So I'm thinking the ratio of egg to cream was off and perhaps that's why they cooked so quickly. Would that be the case? And if so, how would you adjust the recipe if you have only extra large eggs on hand - would you add more cream or reduce the number of egg yolks? Granted I keep chickens in my backyard so my eggs tend to be very fresh - I keep leftover egg whites around 4-5 days in the fridge, covered on the surface with plastic wrap. I add them to omelets, sauté them to add as a garnish, make macaroons etc. Egg whites freeze very well. I have some silicone muffin cups that are useless for muffins but a perfect size for one egg white. Once frozen, they pop out easily. I wrap them individually in saran wrap and then into a zip lock bag. They thaw in about 2 hours and behave and look just like fresh whites. I just made this recipe last night and was very excited to do the burning part with my brand new Iwatani Torch Burner. I soon realized that it is very tricky to make it look like in the video. For some reason, the edge will not melt at the same rate as the middle part so I get a burnt part far from the edge while the edge is still not caramelized. The result is an uneven top with some parts burnt black and some just a light pale cream color. The ramekin size is the same as in the video, 3 1/2" -inch x 1 1/2" -inch. I saw other videos on the internet and they have uneven surfaces like mine but I'd like to make is so it looks as nice as Rouxbe's. Is there a special technique for success? My torch is thicker than the one used in this video. Does it matter? Should I leave the ramekin at room temperature a bit so the cold edge will warm up and will burn at the same rate as the middle part? Well, presentation apart, the Crème Brûlée turned out delicious. I will omit the orange zest next time since I prefer mine without any other flavors. I am always amazed at the quality of Rouxbe, its recipes, its courses, the helpful staff and the wealth of information available. You guys are awesome! So lucky I found you. This is my favorite recipe for dessert and I have made it countless times since I first encountered it on Rouxbe. I finally used orange zest rather than the triple sec on my last batch and didn't like it nearly as well. A matter of taste I suppose. As for torching, I don't think it matters if the color is even but just that the entire surface of sugar is caramelized. That being said, I also discovered that the thinner the layer of sugar, the better. Thus before torching, i lightly wet the surface of each, coat with the sugar and shake off the excess, leaving only what has adhered to the moist surface. This, for me, ensures an even, thin coat that will caramelize easily. Hi Lili, The Iwatani torch is a good torch, so you should be fine there. 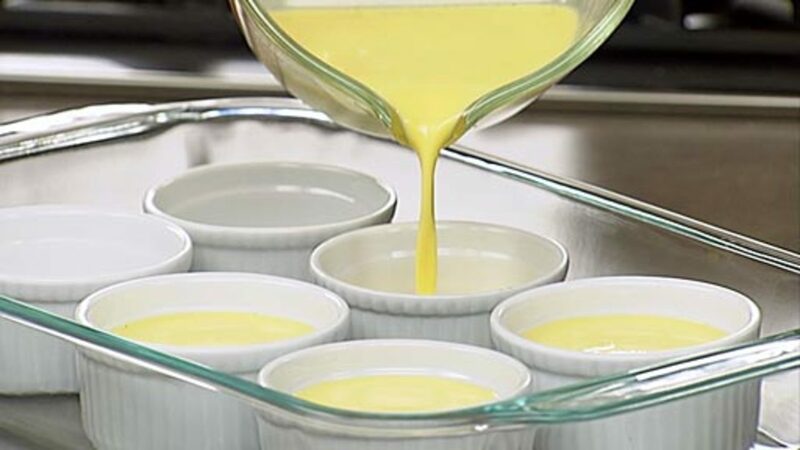 A couple of things that could be happening — first sometime in a narrow ramequin like on the video the shrinkage of the custard, as it cooks, makes it that it has "lips and these edges (lips) do not caramelize well. 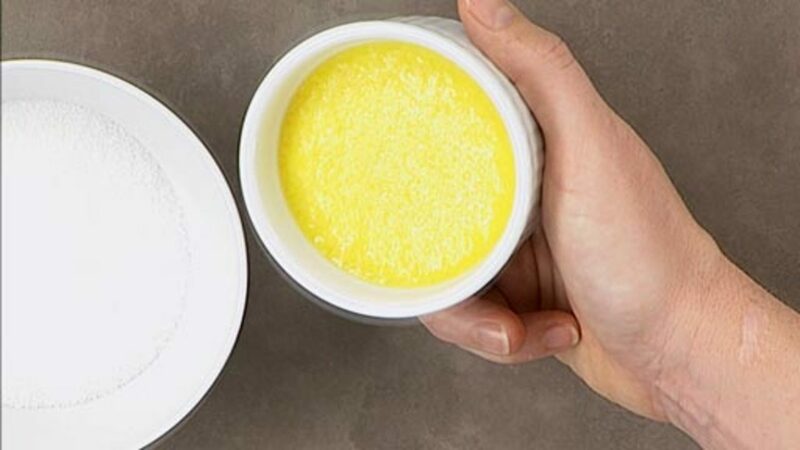 In that case you need to hold the ramekin in your hand (making sure to protected your hands by using a cloth) — tilt the brûlée to have a better contact. Also, the thin layer of sugar on the edge can get wet quickly and make it harder to burn properly. I would continue to practice (Yum Yum) until you find out if it one of those 2 reasons, have fun. When it comes to a nice even top, as Christophe mentioned, it really comes down to practice. I know when I was in culinary school I made many (many) crème brûlée, before I became very comfortable and consistent with evenly burning the tops. Just remember to start with a fairly thin, even layer of sugar. And no, the ramekins should not be at room temperature before you torch the brûlée, the cream below is meant to be cold. I have held many dinner parties where I made crème brûlée for dessert and I would do a competition — I would demonstrate how to do the top and then everyone got to do their own. I can tell you from that, that everyone has their own technique. No matter what, they all came out a little bit differently. It was only those that begged to do another one that seemed to get better each time. Good luck and keep up the practicing. Cheers! Everything worked, custard set, tasted great, but there was a layer of clear sweet liquid on the bottom of each. It's not the first time this has happened. I'm wondering if maybe my sugar wasn't all the way dissolved, settled to the bottom, and then liquified? Or what else could it be? Thank you so much for all your replies, I really appreciate it. I will make it again and keep practicing those suggested techniques like tilting the ramekin. The cool thing is that I get 6 tries each time I make one recipe! My coworker even told me to bring them to work so they can eat it after I torch it. So I said I was not sure on company policies about bringing a torch with a flamable gas bottle to the workplace. She said since she is the HR director she will allow anything in the company just to eat some crème brûlée. This dessert has some serious fans out there! My next try will be with a little triple sec instead of the zest as suggested by John E. I also will let my guests try themselves, I think that could be lot of fun. Who doesn't like playing with a torch? I love it and now I want to torch anything I see. I saw a picture of torched whip cream somewhere. That looked pretty and yummy. Hi Barbara- I'm perplexed by the description, but I think I can visualize what is happening. Does the clear liquid appear immediately after cooling or after it sits (covered and chilled) for a day or more? Any sugar in the custard will either be dissolved (given the stirring and heat) or won't come out of the solution as liquid. Custards contain both hydrophobic (pushes water "out") and hydrophillic ("likes" water, so draws it in) components. It could be that the custard is simply leaching out a bit of water (milk has water in it) and that water is settling to the bottom. It can also be a small amount of whey - caused by the application of heat to milk. I hope this helps! Just wondering how low you can go on the %cream? 35% is really fattening so wondering how 18% or even 10% would be with this recipe. Would it firm up like the higher % cream or not. I imagine it wouldn't be as creamy but if it's still good,,, I could sacrifice some creaminess for health! Crème brûlée is by nature, a very rich dish. Eggs, cream and sugar. Instead of going low-fat with the product, I would first suggest serving a slightly smaller portion. It would still firm up and be very good I'm sure - so it's up to you. Cheers! Hello, can this split on the oven? Whyyyy? Can it be fix? :( Thanks and Happy New Year Rouxbe! Sorry to hear about your creme brulee troubles. It sounds like your creme brulee curdled, either over heating, or from over cooking it a bit. Unfortunately, there is really nothing that you can do to fix the creme brulee. Sorry, I know that's not what you want to hear. 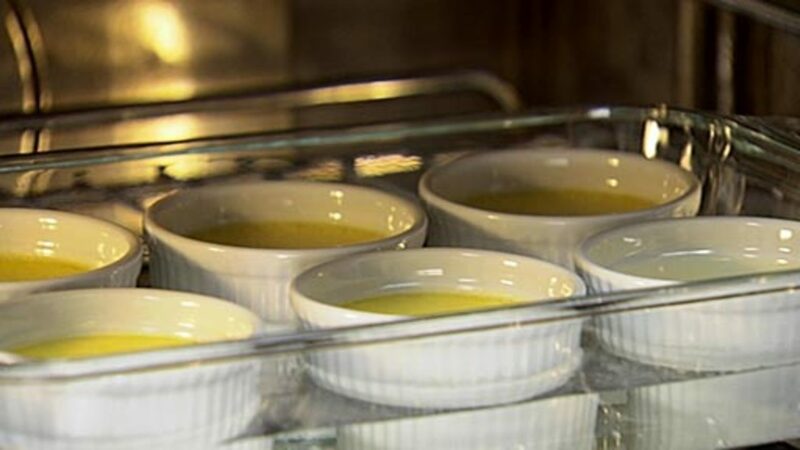 If it makes you feel any better, most every chef has over cooked creme brulees at some point or another in their career. The good news is that it doesn't take long to make and cook another batch — if that's an option for you. Good luck Juliana. And Happy New Year to you as well! Would it be possible to omit using the torch and simply put it under a grill for a few minutes. Using a match would likely result in a spotty top, not to mention some potentially scorched finger tips. A torch really does work the best with this dessert. Cheers! Thank you so much Rouxbe!!!! Thank you so much!!!! I am cooking my mum and dad their anniversary dinner. How long does the creme brûlée last for?? 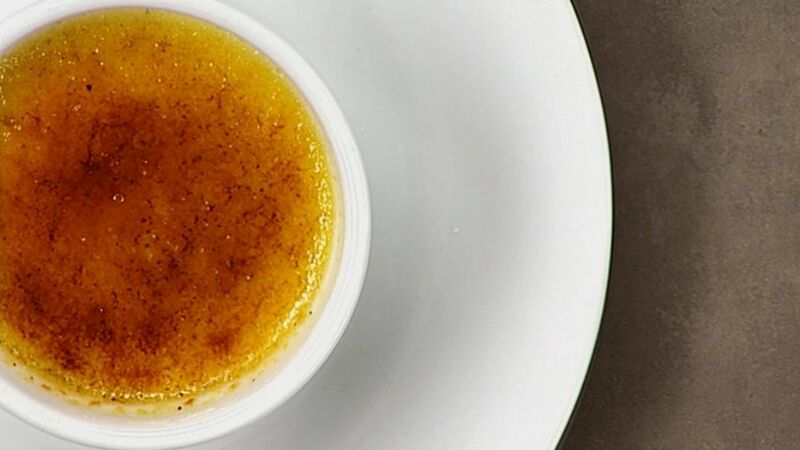 In the notes section of the recipe we have this "Crème brûlée is really very easy to make and it can be made up to 2 days in advance, which makes it a great choice for a dinner party. ", so I you should be good to go. Cheers! No, crème brûlée does not freeze well. Cheers! I made it and it was the BEST!!!!!!!! Thank you so much. Crema catalana is made with milk instead of cream, with cinamon instead of vanilla and goes not in the oven. But the taste it is very similar because of the eggyolks and the caremalized suggar.